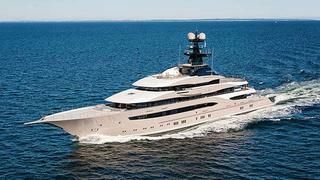 The 95.20 metre Lürssen superyacht Kismet has successfully completed her sea trials. Formerly known as Project Global, Kismet went on sea trails from the 26 to 28 August in perfect weather conditions. She passed manoeuvring and functional trials that included testing her propulsion plant, steering system and fuel system. Her main engines and stablisers were also fine-tuned during the testing procedures. Launched at Lürssen earlier this month, the mega yacht is now back in the superyacht builder's yard in Germany and is set to be delivered later this month. Her sea trials come after another Lürssen superyacht Ester III successfully completed her sea trials in July and the launch of the Lürssen 104 metre superyacht Quantum Blue. Kismet features exterior styling by Espen Øino and boasts an impressive 13.8 metre beam. She is expected to reach top speeds of 17 knots. The project was sold to her new owner by Moran Yacht & Ship who also managed the build. With interior design by Reymond Langton Design, the superyacht is finished in marble and rare woods. She boasts a spacious main saloon with overstuffed settees, a bar and a high-tech entertainment system, as well as a formal dining room seating 18 guests. She accommodates 12 guests in six staterooms, and 20 crew.